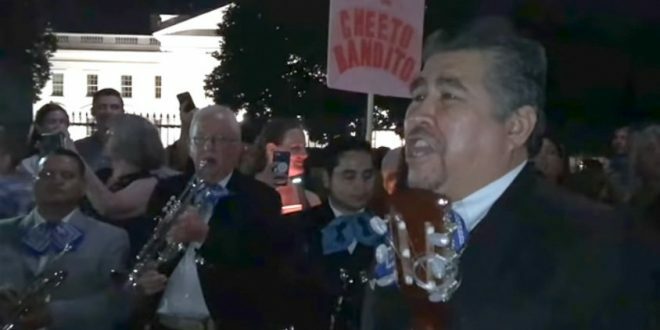 18-Piece Mariachi Band Plays At WH Protest [VIDEO] - Joe.My.God. A former adviser to Hillary Clinton hired a Mariachi band to play outside of the White House in an effort to disrupt President Trump’s sleep on Wednesday night. Adam Parkhomenko organized the performance as part of a multi-day protest over Trump’s summit with Russian President Vladimir Putin. Hundreds of people came to “welcome” Trump back from Helsinki during the #OccupyLafayettePark protests. A crowd-fund campaign on Twitter covered the costs for the band in less than 30 minutes. The 18-person band began playing around 9:30 p.m. on Wednesday night.